I moved over to Victoria from Surrey back in August. Shortly after that (in Sept) Victoria held the Classic Boat Festival in the inner harbour. 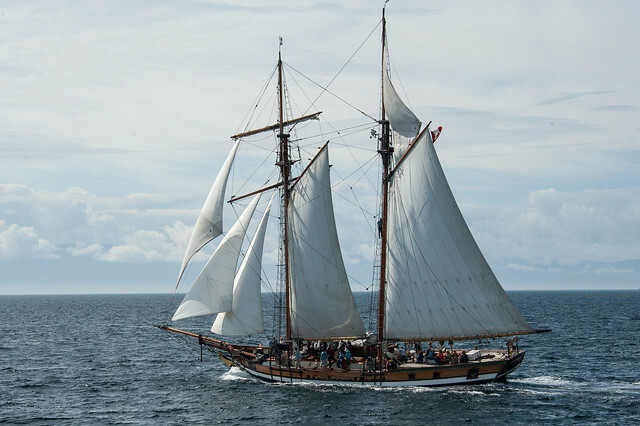 Part of that festival was the sailpast, where all the boats left the harbour, went out into the straight of Juan de Fuca and around a flag ship – our navy’s training ship, Oriole. This is a shot of a private training vessel the Pacific Swift heading out. She’d just caught the wind coming out of the harbour. The Pacific Swift has a sister vessel called Pacific Grace. They were both out that day, along with tons of ‘classic’ motor vessels. I’ve attended this event several times over the years, and I’ve noticed that classic sail is being hugely outnumbered by classic motor. This year, I noticed that some of boats built in the 1950’s and 1960’s were being called classic. Not sure that meets the criteria, but I guess time marches on. Speaking of time marching on; here we are at the start of another month, and I must get caught up here on the blog. Perhaps I can make this NaBloWriMo (National Blog Writing Month) in place of NaNoWriMo and get some posts up about Victoria in the fall. We’ll see how it goes. I do have some catching up to do.